Summary: Trends remain near-term constructive, and price action has still largely ignored some of the recent breadth and momentum weakness seen in the month of March, with S&P having just managed to complete its best Quarter in nearly 10 years' time. SPX is now just 3.2% below its all-time high from September 20, 2018. This is one of the 10 best starts to the year ever, and my colleague from LPL, Ryan Detrick, has noted that over the last 50 years, gains >10% in 1Q have gone on to show gains for the full year 9 out of the last 10 occasions, with a median return of 8%. (1987 being the lone exception) While Technology nearing resistance and counter-trend exhaustion being close should mark at least a short-term peak to this rally sometime this month and potentially as early as 4/4-5, it looks early entering this week to abandon stocks and/or hedge, and further gains still look likely. Meanwhile in the Dollar, we've seen some evidence of price turning higher in short-term fashion last week, which has served to cause commodities to turn lower and signifies that our long-awaited commodity rally is still very much premature. Meanwhile, bond yields remain a key focus as the 3mth-10 year spread has inverted, while US 10Year Treasury yields have gotten very compressed, with yields down to 2.338 before bouncing last Friday. It's thought that this strength in the Treasury market (yield weakness persists in the month ahead, and that gains to 2.47-2.52% would be an excellent time to buy Treasuries for a possible move to 2.25%. Overall, these are thought to be some of the key positive and negatives, shown in Bullet form. 3) Technology's outperformance in March caused this sector to regain the top spot for YTD returns, now showing performance of 19.37% YTD. At 20% of the SPX, this is meaningful relative strength from this top sector. 4) Lack of deterioration. Structurally, S&P managed to get back up above former key support that was broken and exceeded meaningful trendlines from last Fall, now trading just 3.5% below All-time highs. 6) Seasonality is bullish in this Pre-Election year stretch, and cyclically this decennial "9th" year of a decade is one of the more positive, third to the 5th and 8th years. 1) Bond yields are certainly giving a warning of some sort about economic growth and have decoupled from equities as both bonds and stocks have been rallying in unison. 4) Recently breadth and momentum have softened a bit, as seen by McClellan's Summation index, which peaked out in late February. So while the Advance/Decline did move back to new highs, the smoothed gauge of breadth has begun to weaken. 6) The extent of Financials underperformance lately has been a concern given its 13% weighting in the SPX and This group along with Healthcare and industrials all turned in "down" months for March. It's thought that if none of these groups steps up this month and Tech starts to stall, further gains could prove difficult to come by. S&P strength in the final two days of the month and quarter has led to some early pre-market follow-through ahead of Monday's session and it's thought that given a lack of counter-trend exhaustion, a run-up to test and exceed recent peaks at 2866 is in order. It's right to stay long this week, using any minor weakness to buy dips until/unless 2785 is breached, which would postpone any further rally. This week's report focuses on the stocks within the Retailing sector, which have started to turn in some above-average performance lately after a very poor Q4 2018. Relative charts show XRT , the ETF which tracks the Equal-weighted Retailing index, having bottomed out near former lows vs the SPX and now turning higher. Technically speaking, this group looks like one to favor in the weeks ahead, and writeups below concentrate in some of the more bullish technical names to favor. These are as follows: COLM, FL, ULTA, DECK, FIVE, TSCO, DLTR, and SFIX. Stitch Fix Inc. - Class A- (SFIX - $28.23) SFIX looks attractive here technically after giving back about 25% from its gap in mid-March when this surged on record volume. That 30+ million share day in mid-March caused the stock to get over $37 before pulling back in recent weeks. This area just above $28 stands out given the trend from last year connecting lows while SFIX has just made a new multi-day high close as of late last week. Gains should occur which take the stock back to the mid-$30's and to test and exceed prior highs.. Given the current structure this is an attractive risk/reward here because the downside risk is very well defined and one would look to hedge/stop out longs on any close down under $26.82. Columbia Sportswear Co. (COLM - $104.18) Bullish- COLM's gap higher on very high volume last month has managed to consolidate in recent weeks while not losing hardly any ground. This is thought to be a very bullish development which should lead this over $107 and allow for a push up to $120 in the weeks and months ahead. The gap last month managed to clear the entire base seen in this stock since last summer which is a very encouraging development. Overall, one should position long, looking to buy minor dips with thoughts that a push higher is imminent and likely occurs on above-average volume again. Deckers Outdoors (DECK- $146.99) Bullish- The act of consolidating gains over the last seven weeks after a very good rally should allow for some upside followthough that allows this base to be resolved by a move higher in the weeks to come. No evidence of any counter-trend sells are present, and further gains look to happen specifically based on last week's move back to new multi-week highs on a close which can help this get to $160 before any real stalling out. Pullbacks should be used to buy dips technically as its thought that DECK should not violate the longer-term trendline in place. The recent consolidation has helped to alleviate overbought conditions, making this attractive to buy during this consolidation. Dollar Tree Inc. (DLTR- $105.04) Bullish given the degree that this has pushed to the highest levels since last March after having exceeded a very flat bullish base over the last few months. While daily exhaustion could halt this progress near $108-110 in the short run, weekly signals are very much premature and should allow for further gains up to $116.65, near the highs that were made back in February of last year. Overall this looks bullish to buy and use minor pullbacks to add, with only a decline under $94.75 postponing this larger advance. Five Below ( FIVE- $124.25) FIVE looks quite positive given the mini-Cup and Handle pattern that has formed in this stock after already a very sharp rally in recent months. FIVE managed to gap higher last week when LULU rose sharply but remains better positioned technically to show further progress in the weeks ahead. It's thought that gains to challenge and exceed February highs at $133.65 should happen in the near future and it looks right to position long here technically with thoughts of adding on a weekly close over $133.65 with targets near $145-$150. Stops under $114 on a weekly close which would postpone this move. Foot Locker Inc (FL- $60.60) Bullish- FL has managed to consolidate its recent breakout back down to a key area to consider buying technically, as this lies right near the pivot and right above the longer-term trendline connecting 2017's lows. While this has some work to do in order to get back to all-time highs, momentum is positively sloped and upward sloping in recent months given this stock's progress. The ability of last week to close positive after three negative weeks of pullback is seen as a real positive and weekly MACD remains positive while this is still very much trending up since 2017. Overall an attractive risk/reward given this recent consolidation and stability within the uptrend. 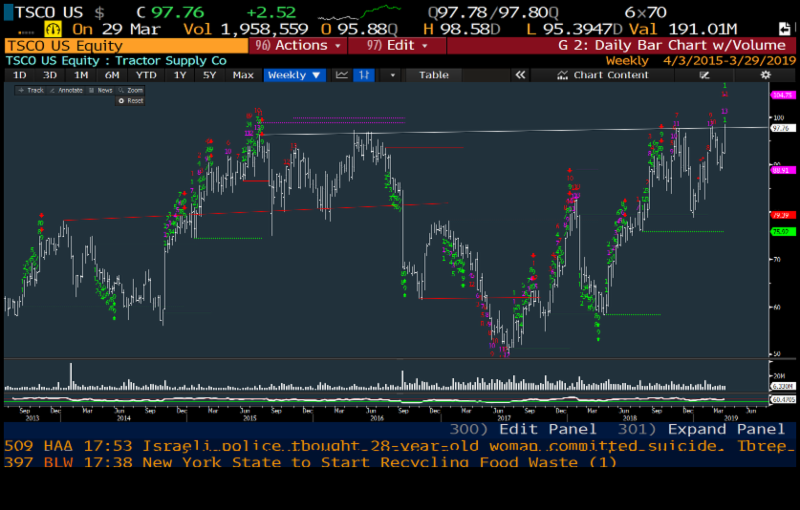 Restaurant Brands International Inc (QSR- $65.11) QSR has formed a bullish Cup and Handle pattern in the last few weeks and prices look to be exceeding recent highs which bodes well for follow-through in the weeks ahead. This company which owns 27,000 Burger King and Tim Horton's restaurants, looks well positioned to move to $70 in the near-term technically and one should position long and buy dips barring a move back down under $62 on a daily close. Momentum is not overbought given the consolidation in the last couple months, making this more attractive from a risk/reward basis. Tractor Supply Co. (TSCO- $97.76) Positive for gains to $120- TSCO shows a very bullish intermediate-term Cup and Handle pattern at work for the last few years and the ability of prices to consolidate near the "neckline" of this pattern in recent months is quite constructive for this technically. While it appears that price is right up to resistance, on a weekly chart, last Friday's close managed to exceed all prior closes going back since 2015, bringing this back to new all-time highs. It's thought that a move up to 100 is likely near-term and then $120 is possible in the months ahead, as TSCO begins a more measured move after moving back to new high territory. Retailing starting to make progress higher after a rough few months.SPDR S&P Retailing ETF, the XRT which is designed to monitor the S&P Retail select Industry index, an equal weighted index to the Retailing sector, has gradually been showing some signs of bottoming in the last couple weeks. Prices have broken back above minor downtrends and we see a very good rebound from late last year that has now exceeded the larger downtrend from last Fall. This should bode well for XRT to strengthen further in the weeks ahead. Signs of rebounding as part of a bearish trend for Retailing- Retailing relative to the SPX remains in a bearish downtrend from last year, but has just reached former lows and has started to show signs of rebounding in recent weeks. Demark indicators on relative charts have triggered Weekly exhaustion and should enable this group to be able to outperform relative to the SPX in the month of April. Thus, Retailing is a tactical overweight and many of the stocks chosen are ones that are showing very good signs of technical strength and should be favored.